Looking for biography books? 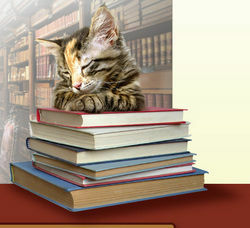 Biblio.co.nz hosts hundreds of of the finest online book stores and booksellers, including specialists in biography. Use the list below to locate a specific specialist bookseller or book store near you. Or, use the form below to search the inventory of all booksellers who specialize in biography. Specializing in signed first editions since 2000. 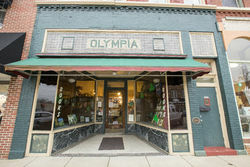 \"A World of Books\" is an Independent bookstore, in business since 2006. The inventory is hand-picked and, with very few exceptions, all books are in Very Good to Fine/As New condition. The inventory is individually listed and we make every effort to provide a clear description of book condition. Every book is inspected before it leaves the store and customers will be notified in advance of any flaws incompatible with the described condition.To minimise environmental footprint, I use clean recycled material wherever possible. All hardcovers are shipped with a FREE Dust Jacket Protector. Adventures in Books is a family-owned and operated online bookstore. 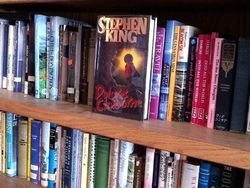 Located in Wakefield, Massachusetts, we specialize in first, limited editions, and later editions, (new, almost new, and gently used) in a wide range of categories for the discerning reader. With competitive pricing (most are deeply discounted), low shipping costs, careful packaging and 24-hour shipping, we offer good value with each purchase. New selections are added daily. We specialize in American Literature. Free Delivery to UK, No minimum purchase(for more details, see our Terms of Sale)Welcome to my storefront. I am an independent on-line bookseller with a wide range of quality books,new,used,first edition,out-of-print and rare titles.We specialise in biographies, autobiographies, literature & fiction, collectable and hard-to-find books. We have a wide range of quality books: new, used, first edition, signed, rare and collectable. Please search or browse our inventory where we have a wide selection of authors and titles, or look them up by category.My aim is to provide a top quality service and 100% customer satisfaction. If you have any enquiries please e-mail me. Thank you for visiting my shop.We are a member of The Booksellers Association. Used, rare and out of print books. FIVE STAR RATING. Well kept, quality inventory that is updated weekly. The Antique Books Den prides itself on operating an honest establishment and guarantees customer satisfaction. Our goal is to keep our customers coming back again and again. We care. Tracking number is provided on all domestic shipments. Fast/ protected shipment. Please contact with any questions. [email protected] AND COLLECTIBLE BOOKS should be well taken care of so that the value and enjoyment increase with age. There is nothing like holding and reading a book that was published over 100 years ago.ANTIQUE BOOKS DEN, WHERE INTERESTING BOOKS LIVE. Honest small business, growing weekly. Earning your loyalty. Selling on on-line since 1998. 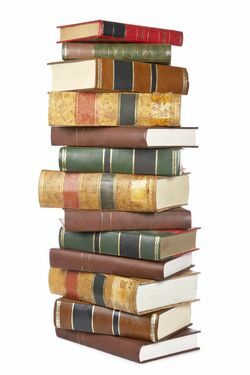 We specialize in used books including the following subjects: dog, horse, cat, pet, animal, history, military, biography, travel, and general non-fiction. Range of new and used books. Booketeria is an online bookstore specializing in Military History, U.S. History, and World History. We also stock all categories of books. 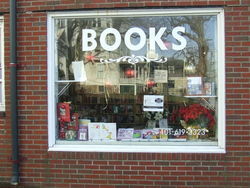 Booklovers\\\' Gourmet opened in 1995 as an independent bookstore, coffeehouse, art gallery and gift shop in Webster, MA. We carry all kinds of new & used books including childrens, history, current events, biographies, cooking, art, fiction, classics, womens studies, poetry, spiritual, self-help. 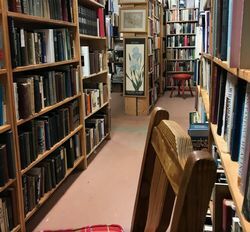 30 years in the used book business, running some of Florida's largest retail bookstores Many thousands of unusual, interesting, and quality books for sale at fair and reasonable prices. Fast shipping with professional packaging. Emails are checked/answered multiple times daily. Your satisfaction is important to me. Now selling on numerous other venues with thousands of HAPPY customers. You can shop here with total confidence. Books provide us with information and knowledge; they can make us happy, sad, smart..... they educate us in so many different ways. We at Books Tell You Why believe in the value of a quality book to provide essential information to kids and grown-ups alike to satisfy and stimulate further the curiosity that drives the development of mankind. What have you learned today? We strive to be leading edge with our products and commit to role model world class customer service. We go the extra mile to connect you with some of the most fascinating books you can find. Books tell you why! Brimstones is owned and run by Geoff Kinderman from a converted barn in the Sussex countryside, with a stock of approx. 30,000 out- of-print, second-hand and antiquarian titles. The stock is general, with lots of 20th Century fiction, and non-fiction concentrated in the braod spectrum of biography / history / politics / social science / philosophy / theology, This is a postal-only business, specialising in internet selling, and providing fast, efficient service, with hgih fulfilment rates, low postage costs, and immediate despatch. We at CambridgeBookstore.com strive to bring you a funky and eclectic selection of high quality books, and to provide our customers with the best service possible. We offer Fast response to questions and we ship Fast. If you unsatisfied with your purchase in any way, please contact us and we will do our best to remedy the situation. We urge you to email us if you experience any problems trying to order a book from us. * Thank you and enjoy your shopping! 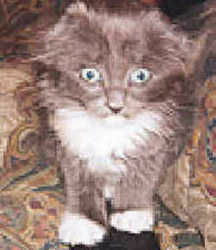 Cat\\\'s Cradle Books has been buying and selling books online since 1999.� Our books include many subjects and titles, but we have especially strong selections in history, politics, literary criticism, biography, religion, and foreign languages. An online used and out-of-print book business on the high plains of Kansas. We have an eclectic selection from private collections, estates and individuals. Looking for that special book? We're happy to do book searches. Clayton Fine Books is an online business only. The bulk of our stock is concentrated in literature, art history and Americana. Substantial quantities of back issues magazines and historical newspapers. We are a small Theological Book store specialising in those books for the discriminating vendor. We also operate a find and wants sytem designed to meet the need of the avid and serious collector. An experienced Online Bookseller, I stock a wide variety of used and out of print books.Areas of interest include art and design,classical music (particularly relating to stringed instruments), exhibition catalogues, modern literature,motoring, sport, philosophy, and more.If you have any questions or queries, please don't hesitate to contact me. Prompt delivery and safe packaging are a priority. Online seller of modern non fiction. Earth Garden publications and recent back issues of EArth Garden, City Permaculture Magazine in stock. Former librarian offers prompt, efficient service. Member of Independent Online Booksellers Association and Australian Booksellers Association. We specialize in serious nonfiction--particularly biography, history, and religion--and other interesting books as fate may provide. Inquiries welcome. Mail Order & Internet Business specialising in Academic Non Fiction on all subjects. Books from 1500 - 2006. Images available on Request. I am the daughter of Pioneer Books, our business has closed down after 43 years and I am listing some of it on my own account now that I'm the proud owner of the residual stock! I am selling them at half the price at which they were listed when Pioneer Books existed. I seek to disseminate knowledge. Located in downtown Kutztown, we are an independently-owned and operated New and Used bookstore. Started in 2012 by two book aficionados, Firefly Bookstore strives to provide the best in diverse products and customer services. In addition to books on almost any subject, Firefly carries a large range of products including cards, bookmarks, audio books, and family tree charts. We carry over 60,000 items in 3000 sq/ft of space.Additionally, we have a large tabletop game selection, including board games, dice and card games, and Role-Playing titles. We have a wide selection of puzzles from Pomegranate and others. We have in stock new, each year, a large collection of current year Calendars with 100s of titles and styles to choose from, always discounted.We buy and trade books and games whenever the store is open, and we are looking for material for every section. Store credit can be used on new and used material. We are interested in large purchases, such as collections and estate sales. We are particularly looking for gaming books, metaphysics, history, cooking, science, Pennsylvania history and children's books.For current news and announcements, find us on Facebook at www.facebook.com/fireflybookstore.We carry new and used books in our storefront. We want you to be satisfied with your purchase. Please contact us if you have questions regarding this itemStore hours are Sunday-Wednesday 11am-7pm, Thursday & Friday 11am-9pm, Saturday 10am-9pm. General used book store selling online since 1997. Online book seller out of Rochester NY. My tastes are libertine and quirky and the selection of books tends to reflect those preferences. We are a small business owned and operated by family. We carry a general stock of antiquarian books with a focus on Charles Dickens, 19th and 20th century literature, history and biography. On-line retailer who specialize in ebooks, used and new books including the following subjects: mystery, romance, literature, science fiction, horror, children, history, military, biography, travel, and general non-fiction. Our bookshop is located in the historic town library building of Southampton, Massachusetts. Southampton lies within the Pioneer Valley of Western Massachusetts with a view of Pomeroy Mountain to the West and Mt. Tom to the North. It is situated between the artistic, vibrant communities of Easthampton and Northampton and the city of Westfield. We have a collection of over 30,000 books with many more waiting to be unboxed and squeezed onto our shelves. The large double-door front entrance will lead you to our main floor where we hold a wide range of fiction and non-fiction titles, as well as a good selection of scarce and rare editions. The original fireplace is surrounded by hardbacks and you can peer out the original nine-foot windows. Take the staircase to the basement and you will find our large children's section and many shelves full of paperbacks. Our physical address is 225 College Highway/Route 10. Our mailing address is 241 College Highway & Clark St. P.O. Box 100 Southampton, MA 01073. The store hours indicated are by appointment only Monday through Friday, and Saturday and Sunday you can stop in. Please call to schedule an appointment if you can't make it to the store on the weekends from 11 am to 3 pm. The best used bookstore in the High Desert! Featuring all kinds of fiction and non-fiction books. High Brow BooksHand selected books for the intellectually elite and otherwise curious creatures. High quality secondhand reads shipped to you from the Berkshire's. "Embrace your inner bibliophile"
Hockley Books specializes in Canadian History with a focus on local histories. In addition there is a good selection of biography and fiction especially literary fiction. Mysteries, travel etc add to the flavour. Josephine DiBenedetto, Bookseller Wide variety of out-of-print non-fiction subjects. Clock Tower Books is situated in the Southern border of Snowdonia in Tywyn. Under the Clock Tower in the AMrket HAll 18000 boks to choose from. Key Books Cork is a community bookshop based in the Quay Co-Op in Cork, Ireland. We are a not-for-profit with proceeds going to community endeavours. We sell secondhand and new books - and also rare, first edition and interesting ephemera. 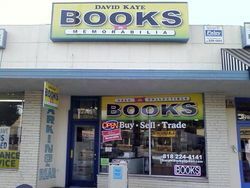 Keystone Bookhouse started in 2010, specializing in biography, history, religion, and business. We have over 2000 volumes for sale. Our mission is to quickly and safely deliver quality books, many of which are hard to find. Lady Lisa's Bookshop. I specialise in modern secondhand non-fiction books. I also have amounts of fiction and out of print books, used books, secondhand books, out of print books, hard to find books, for sale, second-hand books, college books, student books, nonfiction, first edition, exlibrary books sold, signed copies, non-fiction books delivered world wide. We are located in an old schoolhouse built in 1783. We thought books in an old schoolhouse would be a perfect match! Celebrating over 20 years in business. 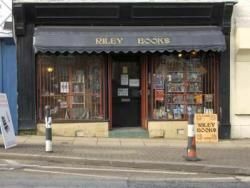 Our shop contains over 20,000 books plus an adjoining antique shop. Weekdays we are open by chance or appointment, weekends 11am to 4pm. Visit our blog at www.lavenderpath.tumblr.com. Explore our boards at www.pinterest.com/lavenderpath. The Gorey Book Stop is a small independent online retailer.We source quality used titles and retail them at competitive prices. Maryland Bargain Books takes prides in offering high quality books at low prices. They include many first editions (some signed) with an emphasis on literature (both popular and classics), a variety of magazines dating back to the nineteenth century, biography, fine arts, and history. WE SHIP FROM GEORGIA. We are an internet only book store at this point. We ship daily and pride ourselves on responding to inquiries in a timely manner. From 1982-95 we weremail order booksellers- since 1995 we have been sellingonline.THEN-in 2007 we opened THE LITTLE RED BOOK SHACK, 2710 Route 9, Livingston, NY 12541--open weekends, noon-5pm, mid April-mid October. See website www.melanienelsonbooks.com.Thanks! Monkey House Books is a mail order, used book dealer located on New York's Long Island. 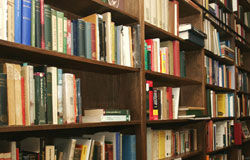 We offer quality used books in a variety of categories at reasonable prices. A home-based business managed by a lifelong bibliophile, Monkey House offers personalized assistance and friendly customer service. For the holidays, or anytime, we provide gift wrapping and recipient shipping upon request. We ship within 24 hours of receiving payment, and packages are wrapped and boxed using recycled/reused materials. We have an eclectic collection of books acquired over the years with emphasis on nature, gardening, science, biography, Canadian history,and the arts. Seller of high quality, hand selected, individually inspected books, cd's, and DVD's. Our inventory is stored in a climate controlled environment! Each book is re-inspected during packing and is handpacked and carefully wrapped. We welcome your comments and questions and special requests. 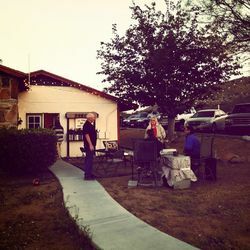 This is an on-line business operated from our home. We have 14 years experience selling on eBay (eBay ID-lj11) and antique malls; two years operating an antique store (Wildwood Cottage Antiques & Collectibles in Oilville, VA). We enjoy it, hope you enjoy our books. 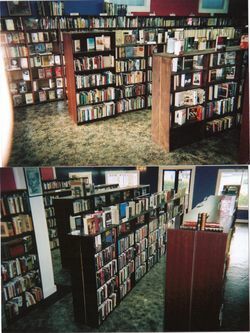 Small, privately owned used book store located downtown in a small midwest town in southwest Michigan. Ours is an on-line for those with discriminating taste. Our prices and selection are excellent and our service is second to none. OUTSIDER ENTERPRISES is a labour of love where the reader is always #1. We are strongly focused on books that would be of interest to both Canadian and US buyers. Local histories, genealogies, family histories, Canada/US Relations, Politics and Biographies. Especially small print and self published books unavailable through regular channels. Established in 2014, PJ’s Bookcase is an online bookstore, selling used and rare books. We are long-time avid book readers and have expertise in many genres. Browse through our list of books to find a treasure of your interest. We also take special requests, so if there is something in particular that you are looking for, please contact us and we will do our best to fulfill your wishes. We specialize in books. Rare, common, or simply used. We are book lovers and enjoy the feel of pages, old or new. Read It Again Books is a small town used book store in Oak Grove, Missouri, near Kansas City. The store has been in operation for 11 years and we have an extensive collection of books of all types. If you live in the Kansas City area, stop in and trade in your books for credit. This site is for our customers near and far to contact us. We will have some books listed here that we don't list anywhere else, and on our links page you can go to other stores for all your book buying needs. We are a town centre bookshop. Our stock includes many more books than currently listed on the Internet. We have large stocks of books on history, biographies, first editions, SF, fantasy, horror, crime, travel, transport and much, much more. Please note that our shipping fees are the maximum we charge. Normally we would reduce the charges for lighter items, such as small hardbacks and most paperbacks, as it is not our policy to charge more for postage and packing than is reasonable to cover our costs. Fast shipping. International shipping available. Second Sunday Books is an independent online bookseller in business since 2007. We offer used, new, rare and out of print books for sale. We also sell music, movies and audio books. Our inventory is comprised of a general selection of hardcover and paperback books with an emphasis on religious, business, biography, autobiography, history, and craft books. Second Sunday ships orders domestically and internationally. We pride ourselves on swift and efficient service with a pleasant and personal touch. This means we offer timely customer service via email and we ship orders on a daily basis. So, regardless of whether we have one or one hundred orders to ship your order ships the day you order or within 24 hours. We add new inventory on a weekly basis so check back often for new arrivals. We sell books of all kinds and description in almost every category. If you can't find it in our inventory we will make an attempt to find it for you. Online store for the sell of metaphysical, religious and spiritual books. We are a bricks and mortar store located in downtown Newport, RI, that has been selling on-line sucessfully for about8 years.We do not list all of our books so feel free to contact us at [email protected], and we will tell you if we have what you are looking for.If you are in the Newport area, stop by to say hello. On-line bookseller since 2000, specializing in scholarly books, particularly European History. I offer mainly out of print and academic books in the areas of Literature and History, but also subject areas, such as Body, Mind and Spirit and Cookbooks. I have rather eclectic tastes, which is reflected in the books that I have for sale. The Book Tree is a friendly and efficient on-line book selling business with over 60,000 second hand and out of print books in stock. We offer a wide range of in and out of print books including general fiction, non-fiction, biographies and childrens books. The M.A.D. House Artists is located in our home on beautiful Grand Lake in Oklahoma. We are so rural even Google does not know where we are. Call for Directions. The M.A.D. 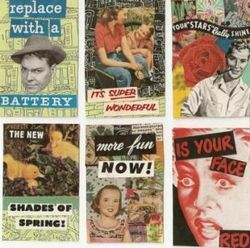 House Artists have amassed a large inventory from private collections, personal libraries, and public library purges. It is our strong feeling that these books should be available for reading, rather than shredding and recycling as grocery bags. Our collection is eclectic and ranges from the sublime to the ridiculous, but so do our reading tastes. If you do not see your book listed, please feel free to contact us, as there are many more not yet listed, and more are added daily. Visitors are welcome, and encouraged to call for directions. The Typographeum Bookshop was founded in 1976 and offers a small stock of books with a special emphasis on British and European literature, as well as fine foreign films. In addition, I am a private press printer who has published a variety of books using the technique of letterpress developed by Gutenberg in the 15th Century. Please visit my website, http://typographeum.us, for much more information, as well as pictures of my shop, both inside and out. A source of scholarly and entertaining books with an emphasis in Philosophy, Religion, History & Literature. Village Idiot's Books (Christlands) Own an Inn in Durham at UNH and maintain selling and show area for all books I inventory for customer inspection and acceptance. No open stacks. Retired bookseller of 22 years now operating from home. A virtual Bookstore, not a Retail outlet. We are a small family business with constantly changing stock. If you don't see what you're looking for send us your 'wants' list. We aim to provide a fast and friendly service but it will aid us greatly, and prevent delay, if you read our Terms & Conditions of Sale before ordering. Thank you for browsing with us. We look forward to welcoming you as a customer in the near future.